The Xfinity brand is sharp and creative, applying the latest innovation and technology to entertain, inform and connect people in new ways. As a division of Comcast Cable, their core business provides customers with instant entertainment and connection—anywhere, anytime, on any screen. 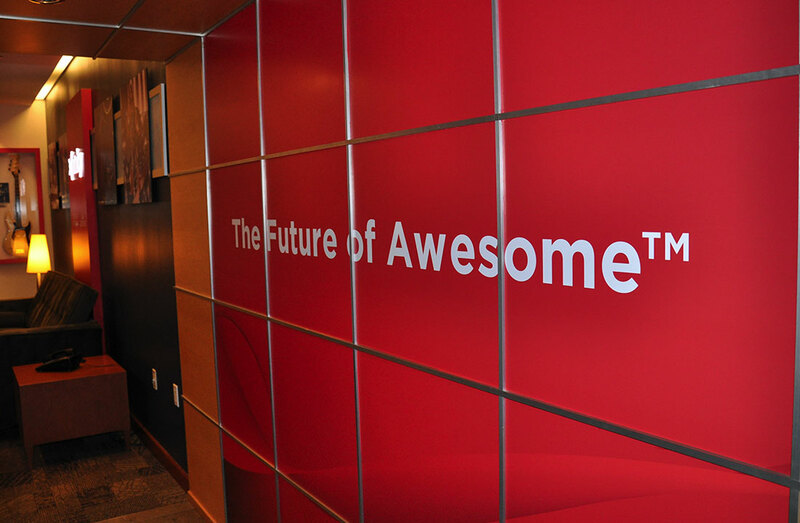 Indeed, Xfinity is The Future of Awesome. 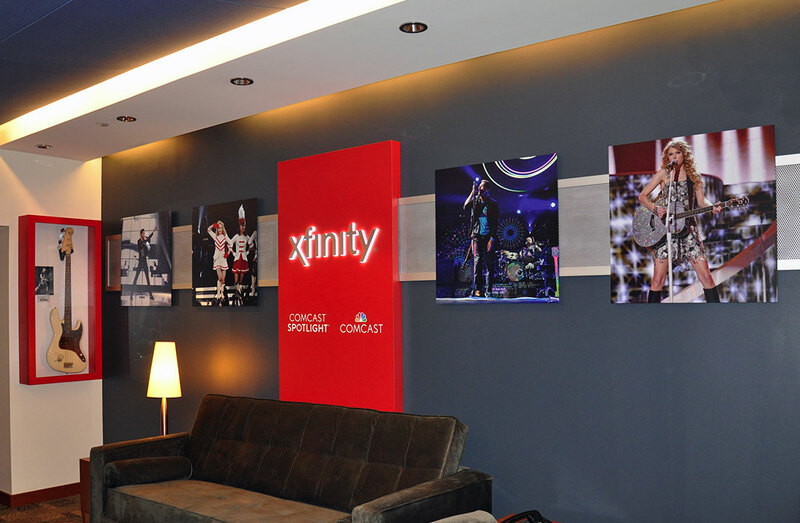 It is in this spirit that Xfinity challenged 2020 Exhibits to activate the Xfinity brand and bring it to life in their Toyota Center Suite. 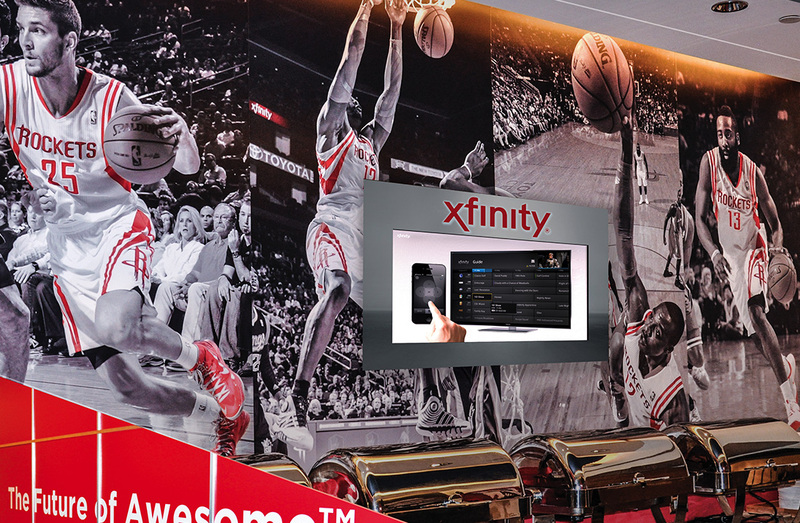 As one of the premier live entertainment venues in the nation, Toyota Center is home to the NBA’s Houston Rockets and also plays host to the nation’s top concerts and touring shows, the perfect showcase for Xfinity. Although wowed by the original design, Xfinity asked 2020 Exhibits to scale back and create an experience that would maximize more limited resources. The goal? Incorporate impactful, memorable touch points to deliver an awesome experience. 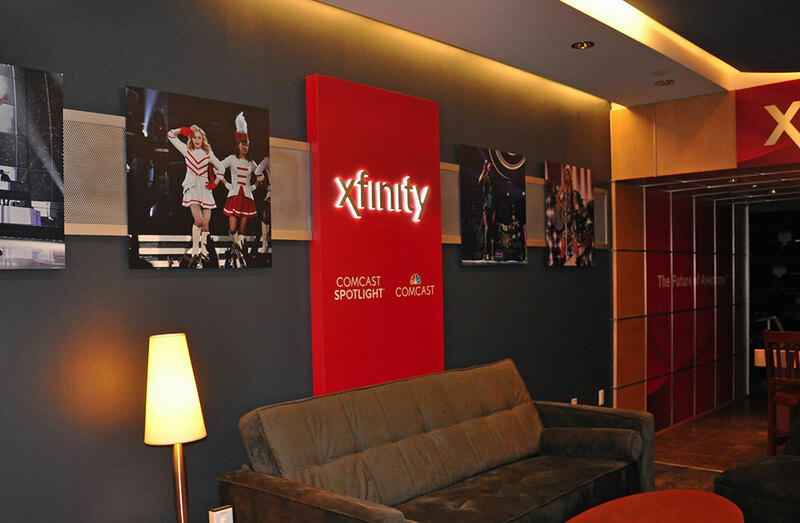 This distinctive 380 square-foot space brilliantly celebrates the Xfinity brand. 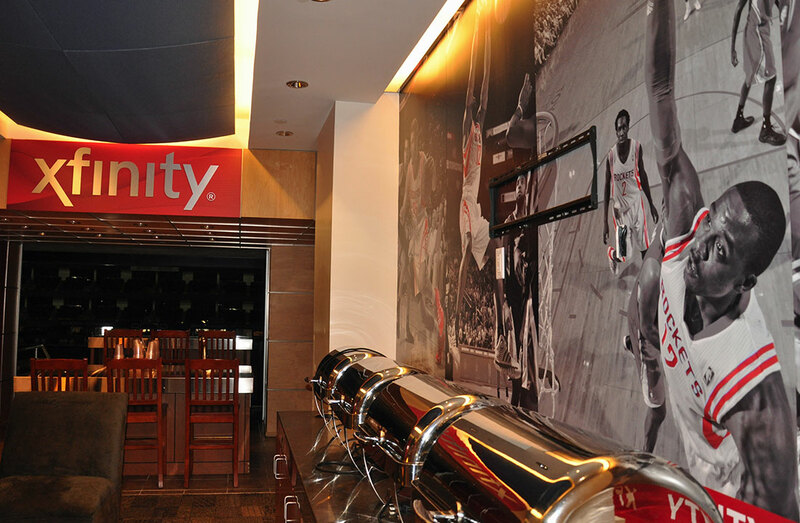 Providing the ultimate fan game day and entertainment environment, the distinctive Xfinity brand experience begins the moment guests enter the suite. Greeted by big pops of the distinctive color in the form of Xfinity-brand red, and light touches of corresponding Xfinity gray, 2020 Exhibits designed and custom-printed a wallpaper mural which stretches across the length of the space. Setting the stage for a fun, engaging environment, this custom-designed and printed wallpaper blazed new trails and was carried throughout the outside seating area as well. Clean and modern, the Xfinity Suite integrates lights, flooring, media, custom-designed wallpaper, individually selected rock and roll memorabilia (give that “just right’ touch) with distinctive seating areas anchoring the space. Comfortable bar seating provides the perfect perch for viewing all of the action. An edge-lit Xfinity 3-D logo anchors the wall of stars with big-name performers like Madonna, Taylor Swift, Justin Timberlake, Adam Levine and Chris Martin hanging out to provide an interesting, rock star vibe. A Mark Hoppus, Blink 182, signed and shadowboxed guitar rounds out that in-concert feel. Versatile, big and bold, the Xfinity Suite combines privacy, comfort and exclusive game day or entertainment branding experience. Designed for use by Xfinity for a wide range of events and audiences, ranging from business meetings, client entertainment, elected officials and employee recognition makes all guests feel right at home. With the exceptional sightlines, impeccable surroundings and first class amenities, no other environment provides a more impressive venue for entertaining. Rock on Xfinity, awesome.